So why use emoji at work? One flaw of digital communication, whether through email, instant message, or text, is the lack of emotion and facial expression. Emoji can be used to express the true intention and tone of your statement. If you’re worried your joke may be interpreted as a serious statement, an emoji can clear any confusion. Adding a smiley face can also prevent statements from mistakenly being taken negatively or can further express positive feelings. 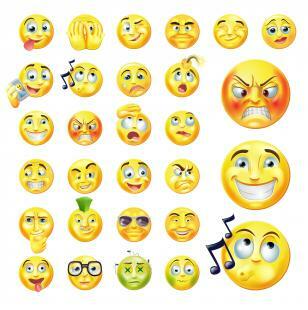 Depending on your company, emoji can be used in office communication or in your brand’s social media. However, be sure to take your company’s culture into consideration before using too many. Emoji use and communication can differ based on the formality of your company, or even your location. Shutterstock released data on 2015 design and emotion trends showing the top emoji or emoticon in each country. While some countries, like the US, tend to stick with simple faces, other countries opt for more light-hearted cartoons, such as Costa Rica with colorful monsters being the most popular. Whether it is a simple thumbs-up or a silly smile, emoji can aid in digital communication. How do you feel about using emoji at work? Does it make it easier to communicate, or do you think it’s too unprofessional? Share your thoughts in the comments!